Please refer to our stock # 1-0225 when inquiring. Large mask, of fierce expression, with protruding forehead and nose, and large, pierced through eyes, nostrils and mouth. The mask is covered with numerous small holes around the eyebrows, under the nose and around the chin, in which animal hair has been inserted and glued with wax. Wood, with dark-brown, sometimes encrusted, patina. Asia, Himalayan Region , 18th century, maybe earlier. Height: 14 1/2" (36 cm). The mask is nicely mounted on a custom metal stand which enhances its strange beauty. Age cracks on forehead and chin, erosion, chips, otherwise good condition. 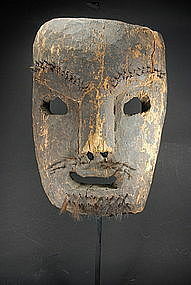 Note: this mask is a good example of the survival of animism in the Himalayan Region, a belief that existed centuries before Hinduism and Buddhism, together with shamanist practices. It may be a representation of a demon, subdued through shamanic rituals to become a protective household spirit.